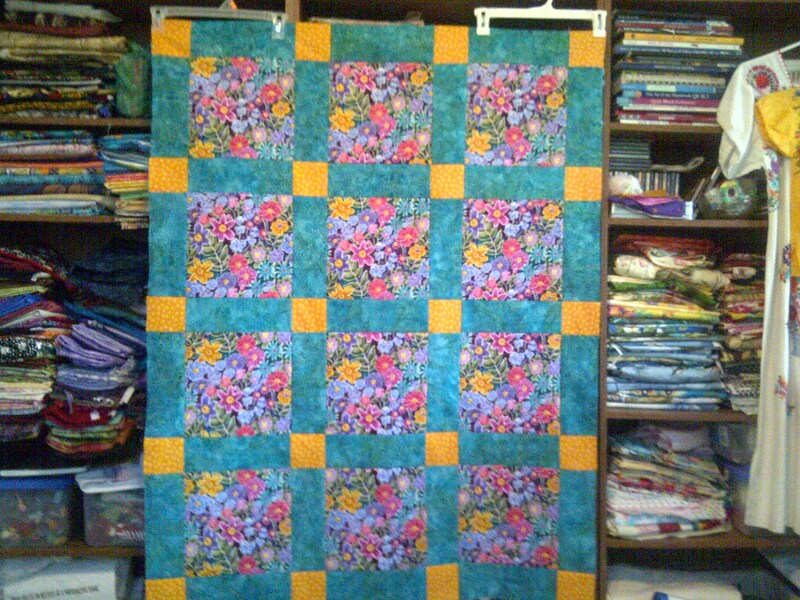 The quilt I promised for my Tai Chi group’s fundraiser tonight is done. With minutes to spare. I was so jet lagged I regretted having promised, but after a week of recuperating, I put the pedal to the metal (my sewing machine foot pedal) and pounded it out. In less than a week! It’s a new record. 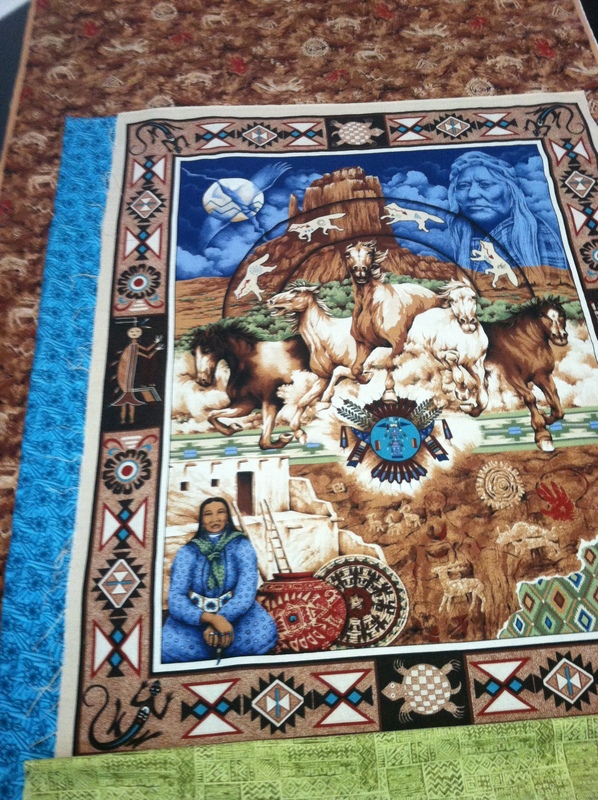 The theme is Native American Culture. 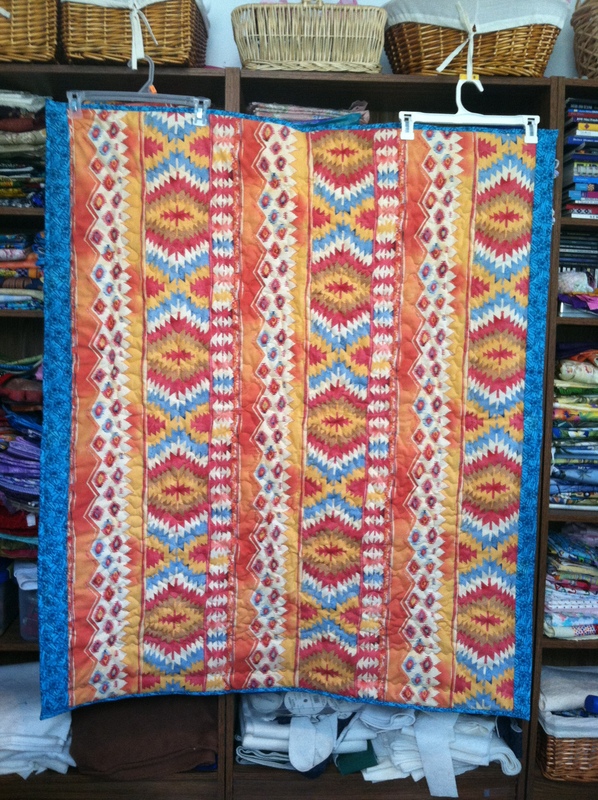 This is a panel quilt. I didn’t do any of that exquisite fabric painting. I merely trimmed it with borders. The back. I like this fabric. I think I’ll make some throw pillows with the rest of it. Due to time constraints I had to resort to crazy, undulating machine quilting. Hope they like it and I hope the raffle brings in a lot of dough. Now I gotta go deliver it. 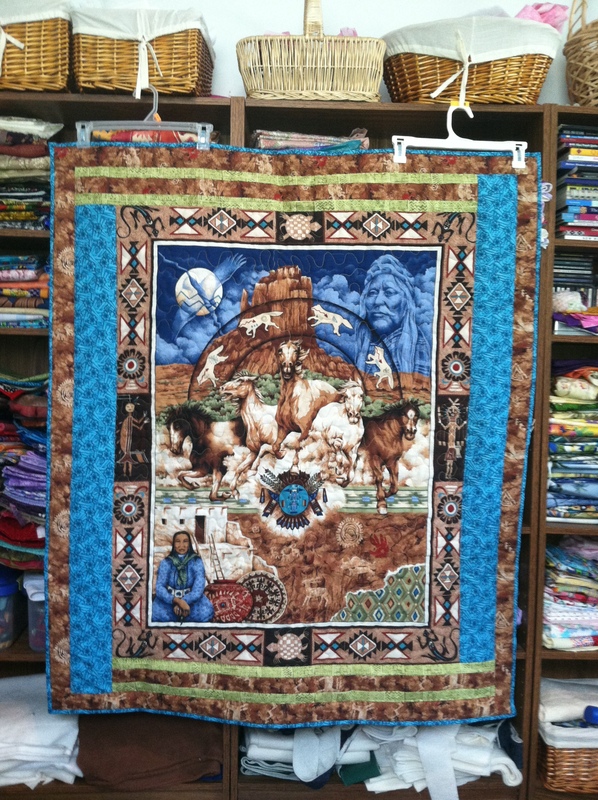 This entry was posted in Blogging, Crafts, Quilting, Sewing and tagged Arts, Craft, Machine quilting, Quilt, Sewing machine on July 27, 2013 by Irma. I’ve been gone for a while and I’m having the hardest time getting back to normal. My routine eludes me. Seems all I have the energy for is cleaning out my inbox(es). I collect not only emails, but email addresses. I’ve tried to downsize, keep to one, but people still send me mail where I prefer they didn’t. And by the time I check, they’ve mushroomed. I need to get back to my reading, my writing, my work in general. I came home but my mind is still making its way to me. Part of it stayed in California with my father-in-law, who is dying. Today finds him in an intensive care unit. That much closer to over there than to over here. As much as I try to stop the images from forming in my head, I can see all the flustered activity around him. A once robust man, he is down to a mere 110 pounds, slowly disappearing. 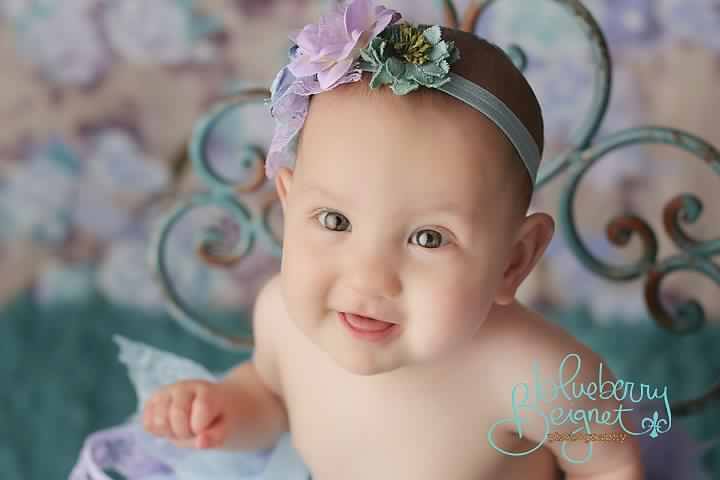 And parts of my mind, my thoughts, remain with my infant granddaughter. After two weeks in Los Angeles, I flew across the country to home and the very next day flew backwards to the middle of the country. The thought of spending a week with her gave me the adrenalin shot I needed to get back on a plane so soon. Uber jet lag, mollified only by the thought of spending my days with my little angel. Days that began at 6:30 am, a shock to the non-morning person that I am. 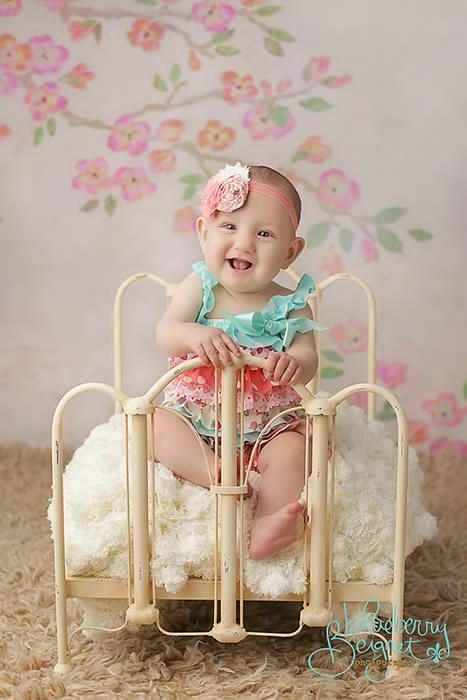 At nine months, she is busy exploring how much she can do on her own, how long she can stand unsupported, how quick Abuela will run when she cries. I didn’t realize how tired I was till I got home and began waking up several times a night wondering what bed I was in. What room was I in? What house, what town, what state? I’ve never suffered such disorientation before. It was quite eerie. Like being in your own horror movie. But now I’ve been back a week and I have to get a move on. 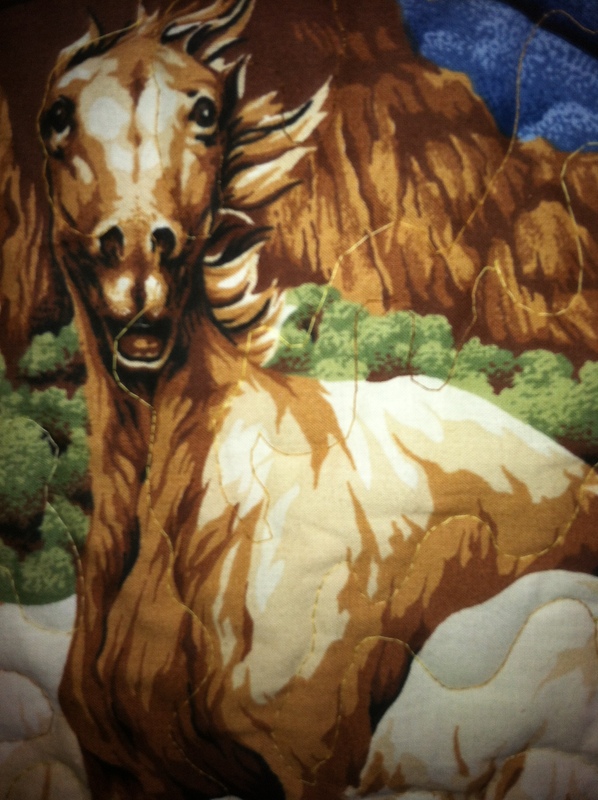 I promised a quilt. Due in one week. Yikes! Theme is Native American Culture and it’s barely in the planning stages! This entry was posted in Blogging, Family, Grief, Happiness and tagged Arts, Family, Health, Love, travel on July 20, 2013 by Irma. 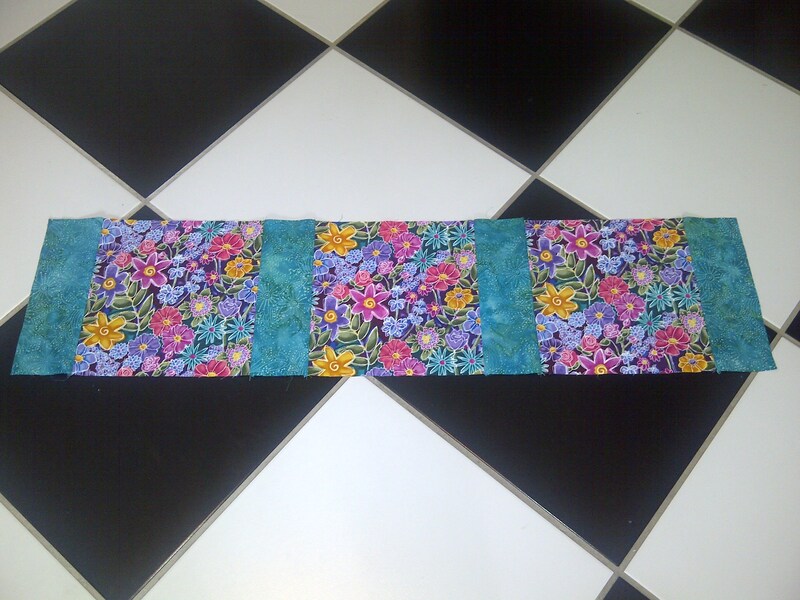 I spent most of the day yesterday speed-quilting. Due to time constraints, I had to choose an easy-to-piece design for our Tai Chi Chinese New Year‘s party which is on the 23rd of this month. I try to make something to add to the raffles that we have at every celebration. 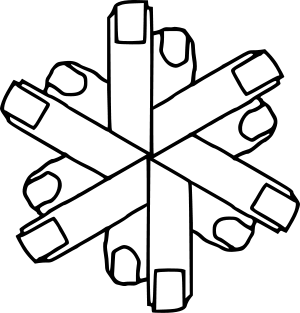 We are a non-profit group and are working to have our own building with a kitchen that has running water. All we ask for is water! 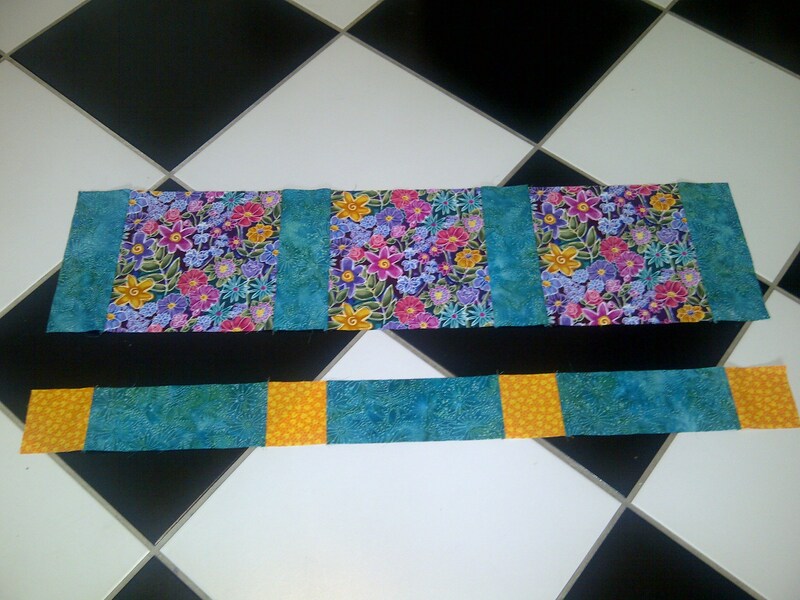 Anyhoo, I ran into a quilting speed bump. 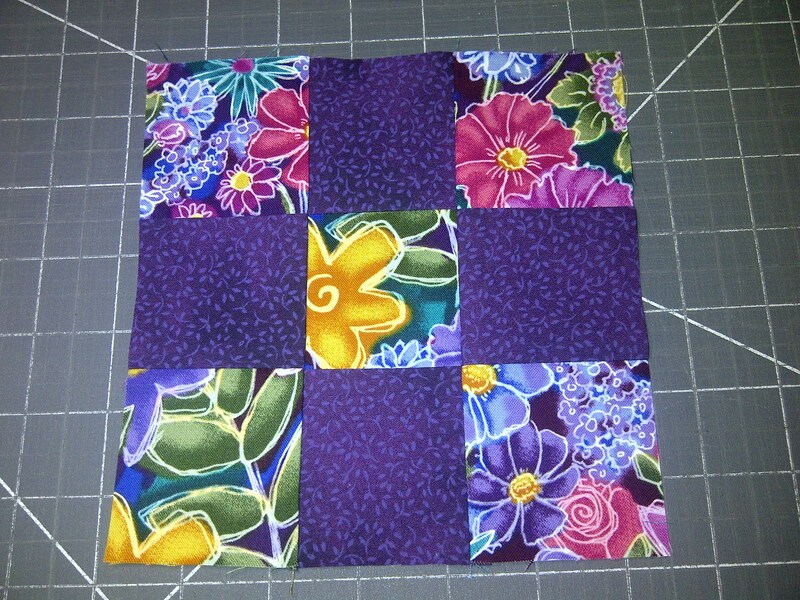 The basic block of nine pieces, unsewn. 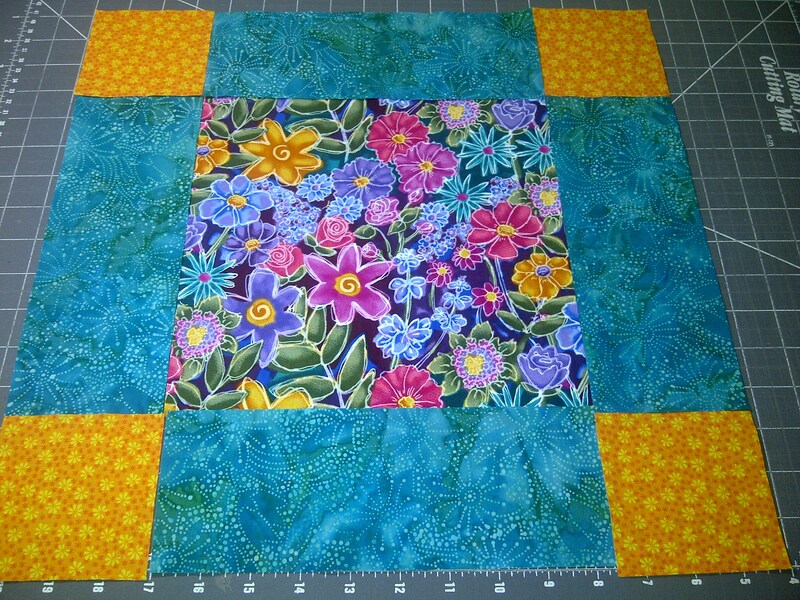 9 x 9 inch squares attached to 3 x 9 inch strips. 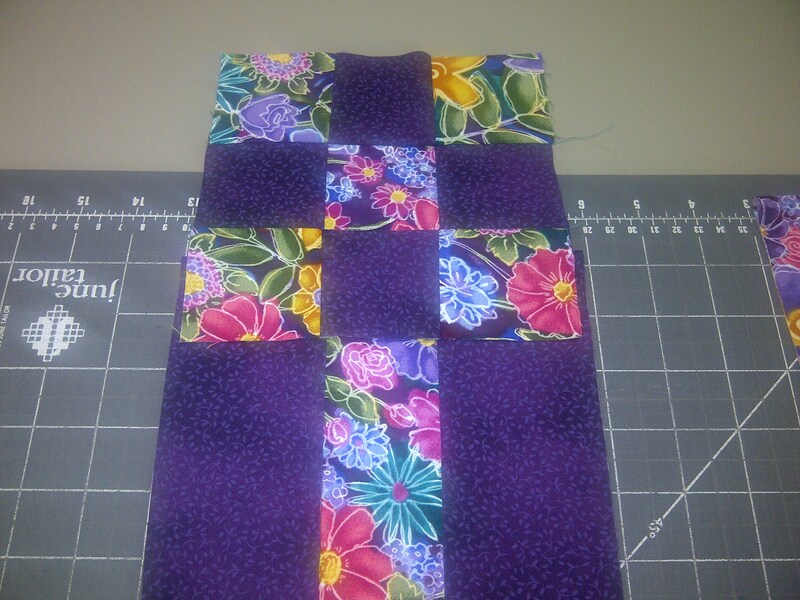 3 x 3 inch squares attached to 3 x 9 inch strips to make alternating row. My floor is so handy to lay out my quilts. To break the monotony, I planned borders. And this is where it all went awry. To give it some pizazz, I decided to add nine-patch blocks at each corner. I was so pleased with myself! And then, I woke up. 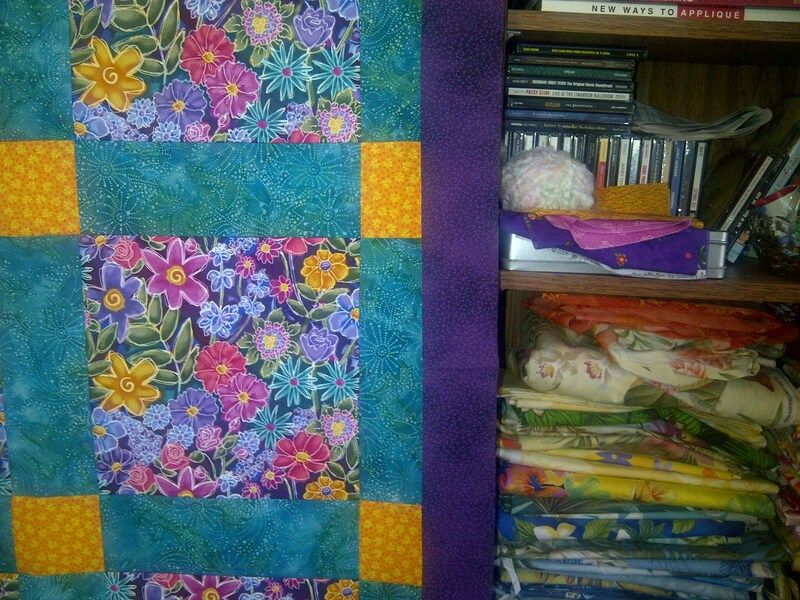 Woke up to the fact that I hadn’t considered the color contrast between the body of the quilt and its adjacent border. 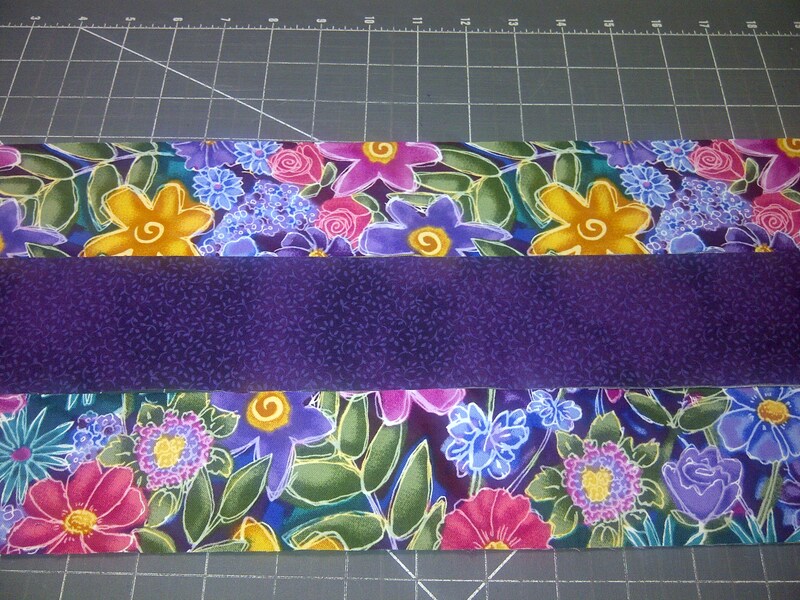 So, it’s back to the cutting board and the sewing machine. My border will have to be reversed. And the corner blocks will have to be reversed as well. Ahhh!! Oh, well, I’ll have to focus on the bright side. I have enough leftover fabric to play with. Worse would have been if I’d used up all the fabric and Jo-Ann’s was out. Don’t even wanna think about that! By the way, this is last year’s Chinese New Year’s quilt. I had a little bit more time to spend on this one. It’s displayed as a wall hanging in the next county’s Tai Chi Center. The lady who runs that Chapter won it in the raffle. 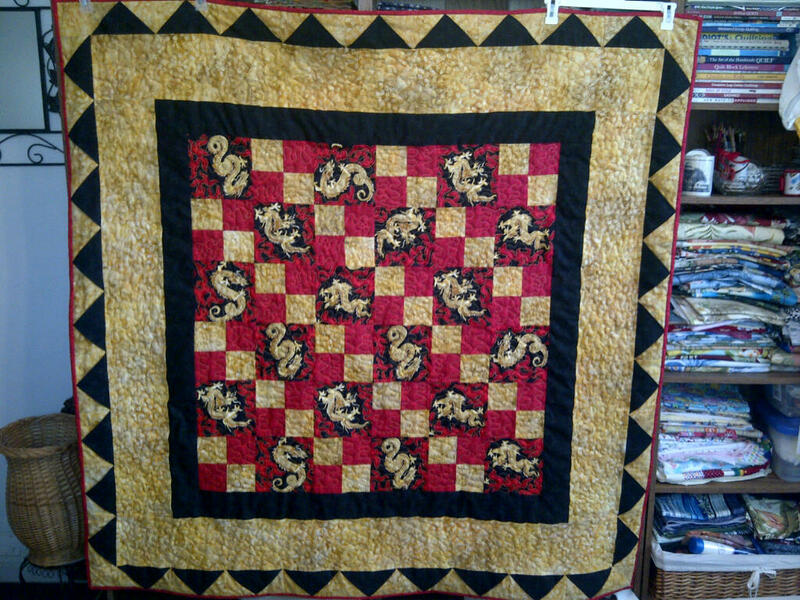 This entry was posted in Arts, Crafts, Creativity, Quilting, Sewing and tagged Arts, Chinese New Year, Crafts, Quilt, Sewing on February 6, 2013 by Irma. They say writing is a lonely business and I suppose perforce it is. The same could be said about reading. It is you, the book and your thoughts, and what you read often makes you wonder, takes you in different directions all at once. Recently, I read that you must write with the door shut and re-write with the door open, (On Writing by Stephen King). I take it he means it literally, but I also see it figuratively. When you write, you go into your own little world and create what you see and what you hear. You imagine all sorts of things, things that may or may not be real. For that moment, they are all too real for you. But when you re-write, you are forced to stand back and take an objective view of what you have subjectively spilt onto the page. You must stand back and take a scalpel to unnecessary words, get those paragraphs into shape, make what you write sound plausible. More plausible than life itself. I truly believe that works with writing, but does it work with writers too? As tough as self-editing can be, it’s much easier to chuck needless words than it is to chuck needless feelings. Can you be ruthless and excise your worries with nary a backward thought? Can it ever be as simple as hitting delete? I find myself faced with that dilemma. My child has joined the homeless. Couch surfing she calls it. Armed with a fresh-from-the-press journalism degree, she is looking for her niche. A job she has, but not in her field and not one that will pay all the bills. She agonized for weeks over her decision, stay or go. I wanted her to come home and she made arrangements to do so, but only as a fallback. In the end, she proved too reasonable, too logical, too goal-oriented. Coming home meant straying too far from her target, a job in The Big Apple. I realize that her staying in the area makes more sense than coming back all the way across the country. But when the door shuts on logic, I still see her as my little girl and imagine all sorts of things, both real and unreal. And it fills me with dread. I know I must force open the door to reason and see her as she is, a woman grown. One that fills me with pride and admiration knowing she has the drive and the determination to not give up her dream, to work and strive for it, and maybe even go hungry for it. Her not going hungry is the one thing I have control over and I won’t allow that to happen, as I am thrust into this new adventure with her. Deep in the night, the door will slam shut on me and I will be surrounded with fearful scenarios that rob me of my sleep. But I know that in the morning, I will make myself kick it open wide. Both for her and for me. For we all know that stress is an opportunist and I refuse to open my door to it. It is not welcome and I will unhesitatingly perform a daily stress-ectomy while I chill and give my Wandering Waldo time. In the meantime, I will write myself a note: Couch surfing ain’t so bad. 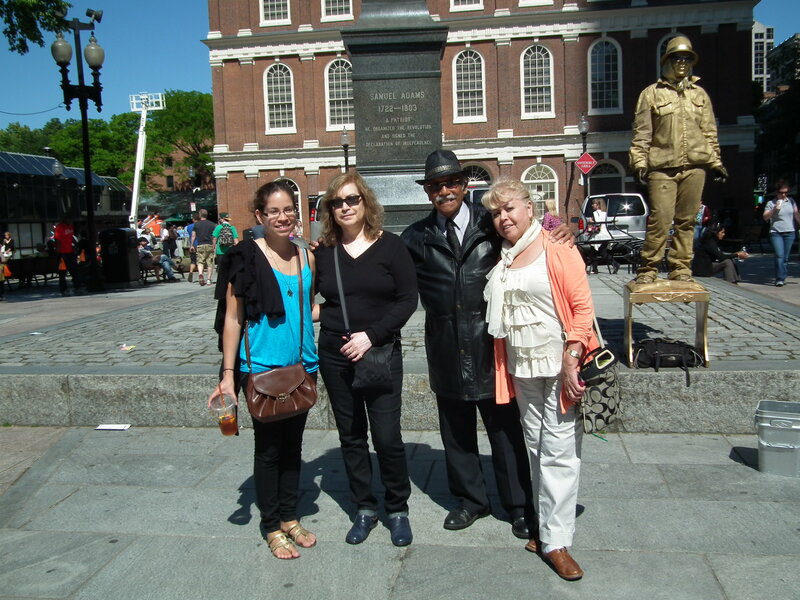 This entry was posted in Life, Love and tagged Arts, Big Apple, CouchSurfing, Life, Love, writing on September 7, 2012 by Irma.